17th century mural of Balarama from a wall hanging in an Indian temple. હિંદુ ધર્મના પૌરાણીક મહાકાવ્ય મહાભારતમાં વર્ણવ્યા પ્રમાણે બલરામ (સંસ્કૃત: बलराम), શ્રીકૃષ્ણના મોટાભાઈ હતા. પાંચરાત્ર શાસ્ત્રો અનુસાર બલરામ (બલભદ્ર) ભગવાન વાસુદેવની છાયા અથવા સ્વરૂપ છે. એમનું કૃષ્ણના અગ્રજ (મોટાભાઈ) તથા શેષ અવતાર હોવાનું બ્રાહ્મણ ધર્મને અભિમત છે. જૈનોના મત પ્રમાણે એમનો સંબંધ તીર્થકર નેમિનાથ સાથે છે. બલરામ અથવા સંકર્ષણના પૂજનની પરંપરા ઘણાં વર્ષો પહેલાંથી ચાલતી આવી હતી, પરંતુ એમની સર્વપ્રાચીન મૂર્તિઓ મથુરા અને ગ્વાલિયર ક્ષેત્રમાંથી પ્રાપ્ત થયેલી છે. ટૅઑ શુંગકાલીન ગણાય છે. also known as Baladeva,Baldau,Balabhadra and Halayudha, is the elder brother of the divine being, Krishna in Hinduism. Within Vaishnavism and a number of South Indian, Hindu traditions Balarama is worshipped as an avatar of Vishnu, and he is also listed as such in the Bhagavata Purana. Within both the Vaishnava traditions and Hinduism generally he is acknowledged as being a manifestation of Shesha, the serpent on whom Vishnu rests. The Bhagavata Purana describes Krishna as the original Supreme Personality of Godhead from whom everything else emanates. As part of this divine 'emanation', Krishna's very first expansion is Balarama, and from Balarama all other incarnations of God then appear. Of the three transcendental elements described in Sanskrit as sat, cit and ananda (eternity, knowledge and bliss), Balarama is in charge of eternity and knowledge. Hence he worshipped as the supreme teacher or Adiguru. Balarama was born to Vasudeva and Devaki. Kamsa, the brother of Devaki and an evil king, was intent upon killing all the children of his sister because of a prediction that he would die at the hands of her eighth son. Kansa thus threw his sister Devaki and her husband Vasudeva into prison, and proceeded to kill each of their children as they were born. However, the seventh child was transferred miraculously from Devaki's womb to the womb of Rohini, who had desired a child of her own. Thus Balarama's other name is also Saṃkarṣaṇa which describes the transfer of the child from the womb. 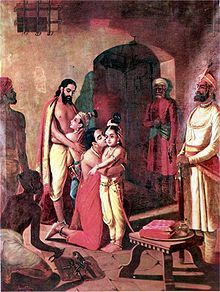 The child was formally named Rama, but because of his great strength he was called Balarama (Strong Rama), Baladeva or Balabhadra. In the Bhagavata Purana it is described that after Balarama took part in the battle that caused the destruction of the rest of the Yadu dynasty, and after he witnessed the disappearance of Krishna, he then sat down in a meditative state and departed from this world. In some accounts it is described that a great white snake left Balarama's mouth at this point in reference to his identity as Ananta-Sesha. And the place where he departed from this world is situated about 1 km far from Somnath Temple in Gujarat. There is one cave at that place and the white snake who came out of Balarama's mouth get into that cave and went back to Paatal Lok as the local people of Veraval says. The Pancharatras, one of the earliest Vaishnava sects worshipped Samkarshana as the second vyuha of Godhead. Coin of Maues depicting Balarama, 1st century BCE. Balarama, holding mace and conch on a Maurya coin (lower right), 3rd-2nd century CE. British Museum. ↑ Bhag-P 1.3.23 "In the nineteenth and twentieth incarnations, the Lord advented Himself as Lord Balarama and Lord Krishna"
આ પાનાંમાં છેલ્લો ફેરફાર ૧૬ જુલાઇ ૨૦૧૭ના રોજ ૧૧:૩૮ વાગ્યે થયો.